Our mission is to provide compassionate, quality care to the glory of God. The word “family” is derived from the Latin word “famulus” which means servant. We strive to practice “servant” medicine and appreciate the opportunity to serve you. All of the physicians at Lovelace Family Medicine, P.A. are Board Certified by the American Board of Family Practice. In addition, they hold Clinical Assistant Professorships in the Department of Family Medicine at MUSC in Charleston and the Edward Via College of Osteopathic Medicine in Spartanburg. Medical students and residents from all areas of the country have come to LFM to experience a two to four week elective of family medicine in a rural area. The physicians are committed to improving access to quality care in rural America. Currently, the facility employs thirty-eight people, including eleven nurses, three licensed family doctors, and three nurse practitioners, representing 8,000 patients from around the area. 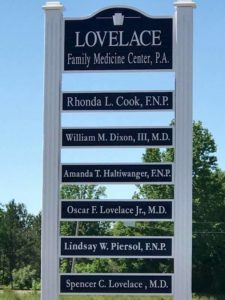 Our Prosperity office, conveniently located on Hwy 76 between Newberry and Little Mountain, was renovated in 1998 and now encompasses fifteen patient rooms, a stress test center, four nursing stations, a shower facility, office rooms, and teaching stations. In one of our many efforts to stay on the cutting edge of medical service, our office was one of the first in South Carolina to transfer all patient medical charts to computerized records. The office has received many awards since we opened our doors, and we continue to find new ways to better reach our community.